Magnetic induction charging has been around for a while now. Most recently it has been seen in the Sprint Touchstone charger for the Palm Pre. However, up until this point the idea has been device specific with a manufacturer creating a charging station for one device at a time. 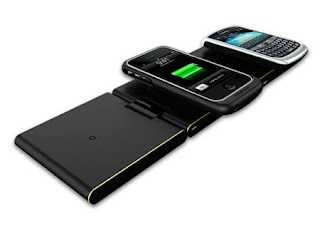 The concept of magnetic induction charging is a good one. If you've ever charged a powered toothbrush (Sonicare or Oral B) you get the idea. You simply place the device in/on the charger without connecting the cords and the recharge power is delivered to the device wirelessly. Well, the Powermat has upped the ante on that concept considerably. Imagine coming home with your iPhone or iPod touch which is badly in need of a drink of juice. You just walk in the door, place it on the Powermat, and... PRESTO you're getting a charge. It's just about that simple. You plug the mat into AC power, place the properly equipped devices on the mat and they charge. Over the Christmas break I decided to brave the Dante's Inferno of the local Best Buy (I could do a whole blog post on their concept of "how not to run a consumer electronics store", but I digress) to spend some of my gift dollars and gift cards on a Powermat Portable. The device comes in 2 models which are basically identical except for the fact that the portable has hinges that let it fold up to 1/3 its normal size for easy packing. That seemed a much better choice for me since they are both the same price and I spend so much time on the road. The portable also comes with a sturdy travel case. Since the device uses magnetic induction, there is an induction component that must be used on the device. This requires either putting a new case/back on the device with an induction component attached (manufactured by Powermat and purchased separately) or plugging your device into a module that sits on the Powermat called the Powercube (one supplied with the device). 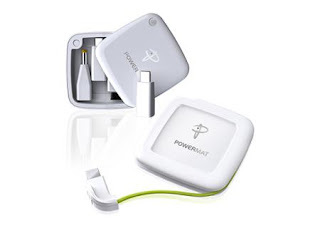 The Powercube pictured above, comes with a variety of plugs that attach to your device where the normal power adapter would connect. The white square portion is placed on the Powermat and your device begins charging. You can charge 3 devices simultaneously, all with one AC connection. The company also claims greater efficiency and less waste of electricity as the three individual areas of the mat shut down independently when the device using them is fully charged. In my short exposure to the Powermat I've been impressed. There is something to be said for the efficiency of simply setting your device on the mat and knowing it's charging. I also like the "greener" aspect of the charging, although how significant that is, that's harder to tell. Overall the device performs as advertised, is easy to use, and it looks like it will simplify my charging regimen. Unless something completely unexpected shows up, I can't imagine why this won't become one of those better ideas I just can't do without. DoubleTwist Media Player does it Right! A New Prosthetic on the Horizon?